Daisy Scout Uniform. This uniform is worn by girls in Kindergarten and first grade. Daisy Girl Scouts were added in 1984 and named Daisies in honor of Girl Scouts of the USA founder Juliette Gordon Low whose nickname was Daisy. The blue tunic has been the main component since the beginning. It is meant to be worn over the girl’s own clothing, but daisy themed apparel is also available and could be worn as part of the official uniform. The daisy badges were introduced in 2000. The center of the flower represents the Girl Scout promise and each petal represents part of the Girl Scout Law. This uniform is on loan from Victoria Grandy. 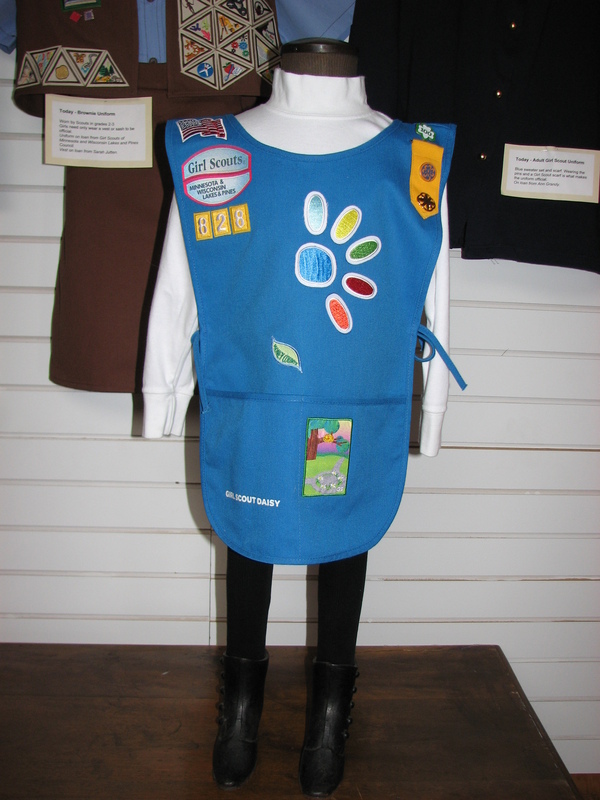 This entry was posted in Collection Notes, Museum updates and tagged 100th anniversary, 1970s, 1980s, Daisy Girl Scouts, Daisy Scouts, Girl Scout, Girl Scout Uniforms, Glenwood Girl Scouts, Pope County Museum, Vintage Girl Scout Uniform. Bookmark the permalink.